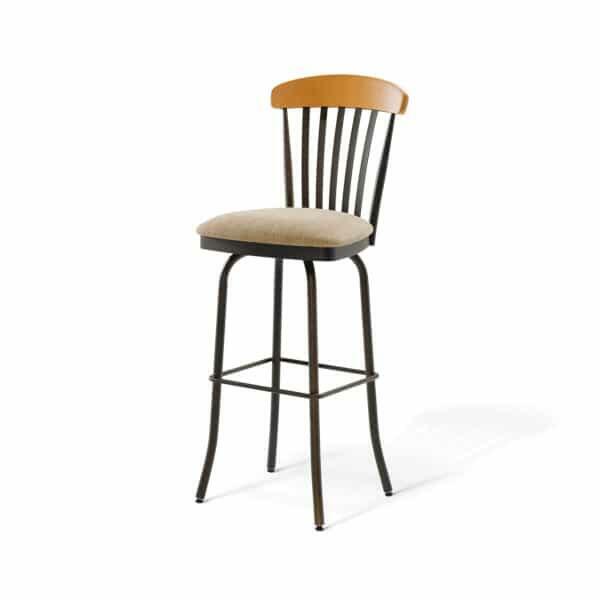 Extra tall bar stools fall into the category of “spectator chairs,” which are typically set in game rooms and home bar rooms, and are beloved for their extra height. The vantage point of a few added inches helps those seated to feel engaged in game room activity, or they fill the gap on those extra tall bar tops or bistro tables. The Tammy Extra Tall Stool comes from the Amisco Countryside collection, which features bar stools that are more subdued and down-to-earth than some of their more urban or library-style stools. The Tammy Extra Tall Stool features a wood backrest, and the rest of the frame is made with coated steel. The nontoxic, ecofriendly coating prevents the frame from unwanted scratches on its surface. The color of finish is up to you, and Amisco has a wide range of options to choose from. The seat features a 360-degree swivel and a plush cushion, which also comes with the option to customize. Choose from another large selection of fabrics to match your favorite finish.